For the second day with Cooking with Moong dal, I made these Gujarati Moong Dal Dhokla that turned out so soft and delicious. This makes a great evening snack. And becomes a great evening snack. I am in a hurry and can’t think much beyond what I need to write. It’s last few days of vacation for Kids and with the chocolates dishes that I made for them, they were very happy. Konda liked this Dhokla and I wished my boys ate this too. Maybe it will take some more time for them! Wask and Soak the moong dal for 2 hours. Drain and grind to a smooth paste along with green chilies. Add the fruit salt just before steaming. Transfer the batter to a microwave safe bowl. 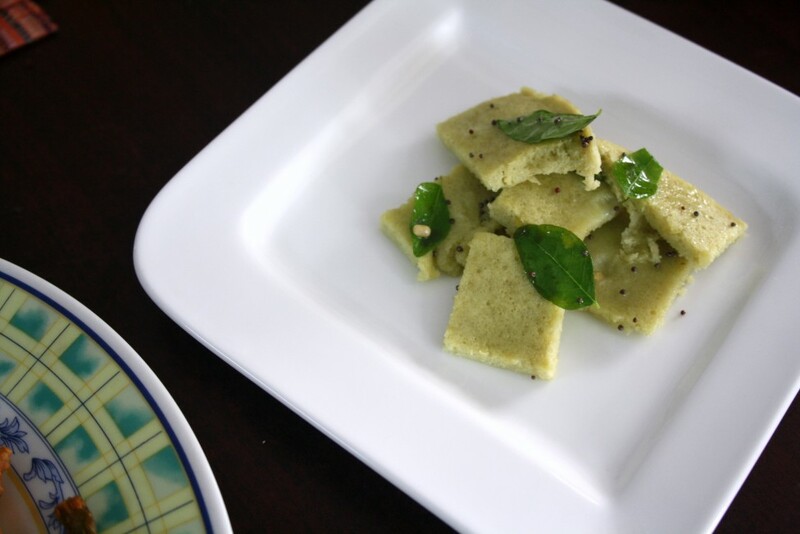 In a microwave steamer, steam the dhokla for 3 minutes. Nutritious and quite an inviting dhokla, loving it. You wont believe me.. I tried at once when I saw this dhokla in your space..Came out very well and my kids loved it.. Thanks for the recipe dear..
that is so yummy!!! i have heard about channa dal dhoklas – interesting to know this version!! Love that Green color Valli!!! Never used moong dal for dokhla, must rey for me. You are reminding me again and again that I need to make peace with dhokla and try them again….will do it soon. Nice one Valli!!! After the besan powder version, this ground batter version. Cool dhokla bites! Very interesting dokhlas. I have prepared them with besan but haven't attempted with moong dhal. Yummy ones. Do they come out fluffy as the regular version? Anon No this is only with moong.